CES 2018: DELL's new XPS 13 (9370) is the smallest 13-inch laptop on the planet. First unveiled at CES 2012, the XPS 13 immediately enhanced the legacy of XPS as the most celebrated laptop and winner of more product awards than any other line in Dell's history, most recently named a CES 2018 Innovation Award Honoree. The new XPS 13 is stylish, powerful and better by every measure. The all-new XPS 13 is now even more portable. It is the smallest 13-inch laptop on the planet, its stunning InfinityEdge display fits this 13-inch laptop in an 11-inch frame. It's a full 30 percent (3.4mm) thinner as well as lighter, starting at just 2.7 pounds. Now with a higher resolution display, incorporating 2.5 million more pixels with 4K Ultra HD compared to the previous QHD+, the 100 percent sRGB display on the XPS 13 gives you great, saturated and accurate color. 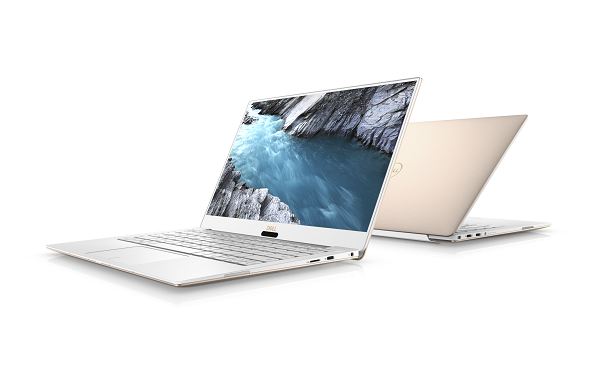 Activated by voice, touch or facial recognition, access to the new XPS 13 comes through a triad of biometric doorways. Log in with a look or a touch with the infrared camera and optional fingerprint reader in the power button for Windows Hello, or talk to your device from across the room, with four integrated digital microphones and Microsoft's Cortana voice recognition capabilities. As for thermal engineering, XPS 13 is the world's first laptop built with GORE Thermal Insulation, the same silica aerogels that have been used in high-tech science and extreme engineering environments to diffuse and dissipate heat, such as insulation on the Mars Rovers and Hyper Velocity Particle capture in the Stardust Probe. This material directs heat out of the device, keeping your system cool while it works hard.